Boiler Overheating? Here’s Why, And What You Can Do About It. Having problems with your boiler overheating, and cutting out when your hot water is on? No problem. In our 5-minute guide, we’ll cover everything you need to know, so you can get your boiler up and running again. Before we carry on, you can get a repair quote from a professional here. Rather invest your hard earned cash in a new and reliable boiler with a long warranty? You can get a Worcester boiler fitted by BOXT (part owned by Bosch). Their clickable form takes less than 90 seconds to complete, and your price will be displayed on screen. Why Does My Boiler Overheat, And Then Cut Out? When your overheats and cuts out, it’s called a boiler lockout. This is a shutdown procedure that all manufacturers incorporate into their design. So, when a boiler becomes unsafe, it shuts down. The problem then needs to be fixed, and the boiler reset. Pressure release valves are exactly that. When a boiler gets hot, it needs to relieve pressure through the PRV. But, PRVs are known to leak. Some (dodgy) engineers will remove or seal the PRV to stop the leak, not realising that this can lead to a boiler overheating and worst-case; exploding! Thermistors will work in line with the boiler’s heart; the PCB. The thermistors let the PCB know if the demand for temperature (and therefore, gas, oil, or LPG) is more, or less, than it is currently. A failed thermistor could result in too much fuel being provided, water getting very hot, and the boiler overheating. If you’ve read our guide to boiler noise, specifically, boilers making whistling and kettling noises, you’ll know it’s a problem related to the heat exchanger. Limescale comes from mineral content in water. It happens in hard water areas. When it builds up on the heat exchanger, it creates hotspots. These hotspots are what make the whistling sound, but it also means water is boiled at temperatures higher than it should be. This leads to the internal components in a boiler overheating when the heating is on. Central heating sludge is debris that comes from the inside of pipes, valves and radiators. Essentially, it’s dirty water with parts of rust in it. When it clogs up a heating system it can create back pressure, sometimes blowing the pump seals. If the PRV isn’t fully functional, it can lead to a boiler overheating and turning off. A condensate pipe vents gas from your boiler outside. If your boiler is overheating in the winter or in the morning, there’s a good chance this pipe is frozen. And, if your boiler is overheating throughout the year, there’s a good chance leaves and dirt have made their way into the condensate pipe. One problem that’s overlooked when it comes to overheating boilers, is the pump. When pumps are overheating, there’s usually one reason; it’s seized. Pumps should be warm, as they are motorised, but they shouldn’t be hot. If a pump is too hot to touch, there’s a good chance that internal components are seized. A gentle tap can sometimes stop a seizure, but it doesn’t fix the problem. The pump needs to be taken apart, cleaned and inspected. The most common causes of boilers overheating is limescale and sludge build up. Preventing boiler lockouts from overheating is simple. Hopefully that’s helped uncover the reason why your boiler is overheating and cutting out. Still no good? Check out our guide to top combi boiler problems here. Ready to get the problem fixed? Get a repair quote from an engineer here. 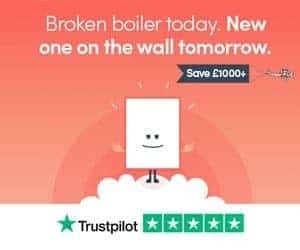 Prefer a boiler replacement? Get your on-screen price in less than 2 minutes. Any questions? Leave a comment below and we’ll answer as soon as possible.